Social Networking Sites & Social Media are increasingly an integrated part of mainstream society, culture and business. While we are still not sure what they really mean for us, the evidence of their extended impact and influence is ongoing. Recently released movie, "The Social Network" demonstrated the reach of such technologies and mediums to those who are not actively engaging in it. And the popularity of such sites and media's, especially Facebook, is set to continue growing. Despite the demonstrated involvement from many Kiwi businesses, which is largely limited to "setting up a Facebook page", the implications and risk of social media should not continue to be overlooked. In fact, NZ Government have even established their own version of Facebook, i-Govt, which is part of the ongoing move towards e-Democracy we are seeing internationally. The blog below gives some more insight and perspective on the relevance and importance of considering Social Media for any Kiwi Business or Individual. To view the Hub Dashboard click here or use the menu on the left hand side of the site. Old Models & Traditions verses the new 3.0 version...? Which would you back? As ultimately, one will kill off the other. SPEAK OUT: Jess Maher is trying to change people's attitudes to cyberbullying through her charity Sweet As Social Media. The death of her father got Jess Maher looking into the darker side of social media. Miss Maher became frustrated at not being able to control the online profile of her late dad, former Vodafone chief executive Grahame Maher. She soon became interested in what people's rights are online. "I realised that we don't have any digital rights. After I reported dad's death to Facebook and memorialised his page, they deleted every post he'd ever made." Now the 27-year-old Massey resident is trying to help young people combat cyberbullying through her charity Sweet As Social Media. "John Key has said that schools need to fight bullying. But schools can only help between 9am and 3pm. What about outside of those hours?" she says. Kelston Boys High School principal Brian Evans says schools do their utmost to prevent all forms of bullying including making regular checks on Facebook and Youtube. 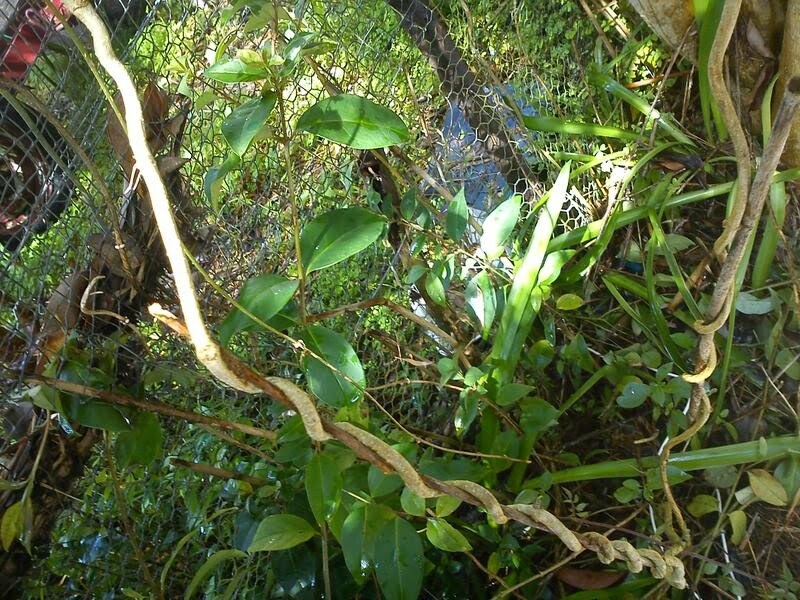 "But when it comes down to contact between individuals it's difficult to control," he says. Miss Maher says young people spend a large proportion of their time in the digital world talking to each other by text messages or on the internet. The bad behaviour that might once have occurred face to face is happening online or by text. Miss Maher says parents who are not IT savvy may have no idea what their children are doing. She wants people to start taking what happens in the digital world seriously. Miss Maher is using the places young people gather outside of school hours, such as Zeal recreation centre in Henderson, to get her message out. Sweet As Social Media set up a You Tube booth at Massey Community House last month. The idea was to give young people who don't have access to the internet at home the chance to record their thoughts about preventing cyberbullying and put their videos online. The charity is also creating a free online magazine that will give parents information about how they can protect their children from cyberbullying and encourage good behaviour online. "We're going to have a launch event on July 7, which would have been dad's birthday. "I want to create something positive. Dad was all over Facebook so if we can get some learnings out of his death, that's great." Martin Cocker is executive director of Netsafe, which hosts New Zealand's Cyberbullying Taskforce – made up of school, business, parent and telecommunications representatives. He says people who have not been exposed to cyberbullying struggle to understand why it's so disturbing. "In the past, if you were bullied on the school bus you could get off the school bus and feel safe. Now, if the bullying is happening via your cellphone or online it can be relentless. "You might say `why not turn the phone off?' But for many people these days that's how you keep in touch with your social network. And no one wants to be disconnected from their friends." 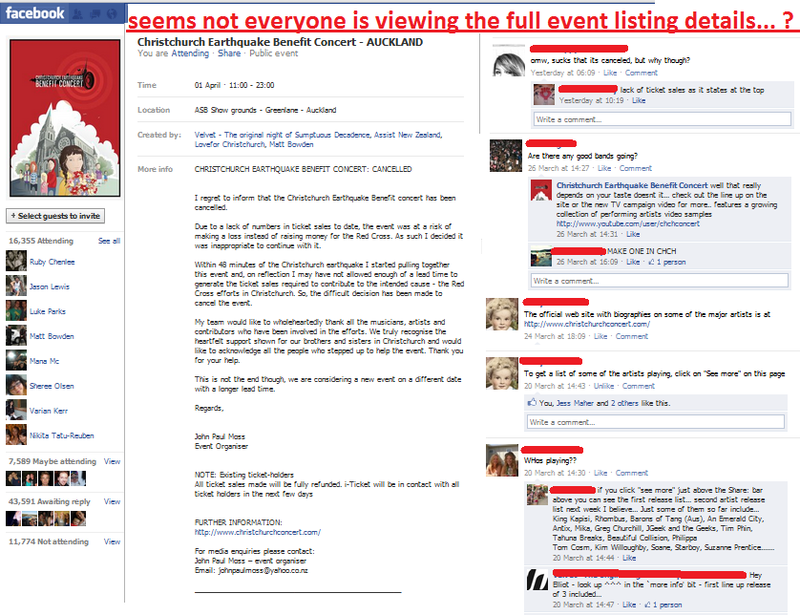 See www.netsafe.org.nz or www.sweetassocialmedia.com for more information on how to combat cyberbullying. You are wasting your time, you can't control peoples interaction with each other without implementing censorship. You wouldn't want to be responsible for that. Anon would be angry. Well done Jess! You are filling a huge integrity gap that is being created online. Keep up the great work! Required. Will not be published. Registration is not required to post a comment but if you sign in, you will not have to enter your details each time you comment. Registered members also have access to extra features. Create an account now. First Event & our Launch of the “YouTube Booth” went off this afternoon! We experienced a few glitches, which is to be expected in any “first” really, including missing a lot of a school traffic with a late set up but we still managed to engage a few of the local kids in the community, with roughly 5 or 6 of them starting from start to end… Above you can see the play list of all the footage from the arvo… a lot of people don’t seem to like the camera it appears, including one of the Reb Bull girls which shocked us a little, but props to her for getting in front of the camera anyway! Unfortunately the sound on Mr Whippy’s is no good as our web cam did not like the wind! Paula Bennett, who did not seem to like the booth too much for some reason, was nice enough to record a clip for us anyway but we are struggling to get it up as we had to do it on Jess’ phone instead! Thanks to all that come along in support and especially to those who were game enough to jump in our Youtube Booth for us and help us share the message and thanks especially to Chade from Sports Waitakere, Skylar from ICE box, Jane from Massey Community Center, Sam from Diesel Phoenix, Richard from Mr Whippy, the Red Bull girls (sorry didn’t get your names! ), the team from PDF2Print, Mike from Burger Fuel Lincoln Road, Andy from Social Safe & Minister Paula Bennett for stopping in..
And last but by no means least, massive thanks to Kristi, the “Twirls”; Jude, Anthony & Alanna; Terence & Kelly-Ann; GJ; Matt East & Sir Peter Leitch (Mad Butcher) and anyone else who we may have forgotten to thank here! Always have your projector going! It makes all the difference for kids to then get to see themselves on the channel instantly. More interaction with thier stories and content, need to explicitly ask questions maybe, even have cue cards for booth operator? We held our first ever community workshop, tonight focusing on Digital Parenting and Kids using Social Media at Massey Community House (19th May 630-830pm). We had anticipated a struggle with achieving considerable attendance in numbers as per the reports we had heard and been told by others trying to mobilize projects in this area, despite their best intentions, parents seem to be very unsure, potentially rather overwhelmed and otherwise, rather inactive in their parenting roles with kids today when it relates to an online forum particularly. With 98% of Kiwi Schools having internet access and iGovt launched last year, the digital world is now so integrated & embedded in our societies that it is being becoming more difficult to imagine our lives without technology. For those of us who can remember the fear and threat of the "Y2K Bug", the last decade has shown us rapid and exponential growth in online technologies. Not only are our virtual realities now a part of our daily lives, but they have fundamentally and radically changed them. Today, we have got the point where reports state that one in four kids have an "online presence" before they are born. Its still largely a "wild west" online and kids remain squarely in the firing line. They are acutely aware they know much more about these technologies than any identifiable authority figure and reports show less than 50% of households appear to define or set any kind of rules around internet use. Of those parents who do set rules, it is reported only 20% of them actually try to enforce them. Working in this area for clients our...selves, we found many unanswered questions & issues, some scary & concerning behaviour & approaches of youth using digital technologies, schools in our opinion largely falling short of the responsibilities of them in such cases and the parents having no idea. We will provide an overview of the existing support and resources avaliable to parents & caregivers to protect thier kids online and briefly explore some of our favourites. Provide an overview of the main concerns for parents & commonly experienced traps of youth by sharing some of our own experiences. Providing "take home" resources and guides to Family Security & Saftey online and enable discussions to focus on areas of concern or contention among attendants. Finally we will work together to draft relevant "house rules" or guidelines to attempt to iniate ongoing conversations between parents & children as in this case especially, "prevention is the best cure". 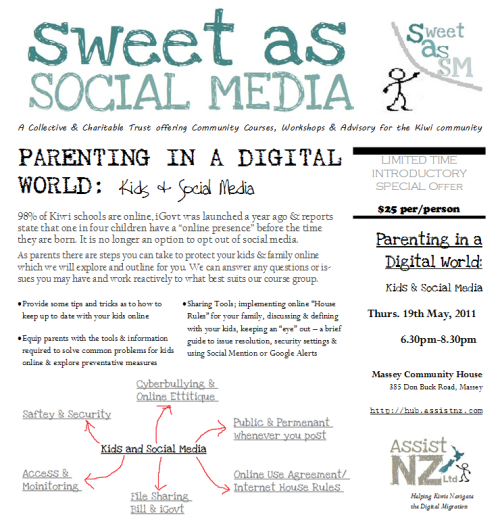 Our first Sweet As Social Media Community Course is coming up on the 19th of May from 630pm-8pm at Massey Community House (the old library building) in Don Buck Rd, Massey. Aimed at Parents & Caregivers, we want to provide insight into the context & issues being discussed by educators & internet saftey groups online that affect thier kids. With cyberbullying, extended use and oversharing being common parental concerns in our experience, we provide some eady to follow guides and outlines to assist parents ensure the security and saftey of thier home networks and explore education & school processes & issue resolution for online problems & the array of support & resources available to parents online & in the community. This really sums up the crux of it though, there is a real need for Digital Etiquette, not only from our kids, but us online... This lesson plan from the Australian Govt could also be used as a talking point for parents with older kids also. What we need is a few more ideas like this RAK one to be pushed through schools & communities to restore a sense of collective community in our local areas..
Quite a controversial topic these days. 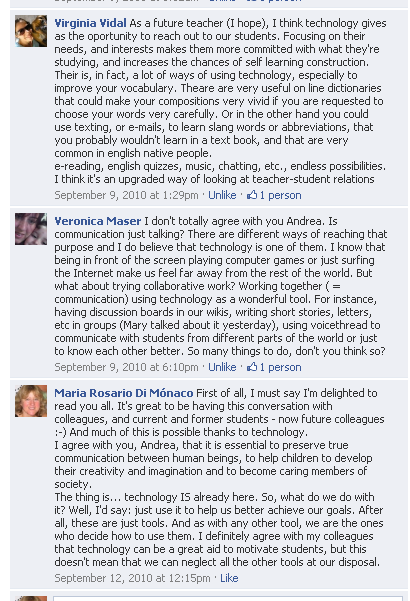 I had my qualms about using Facebook with my EFL students, mainly because of the privacy issues the network has been involved in. However, since one of my main objectives is to have my students use the language in a way that is meaningful to them so that they can continue learning outside the classroom walls, I had to give the issue a second thought. After all, is there such a thing as "online privacy"? I don't think so. The moment you click "send" anywhere on the web, the information is no longer yours alone and can, in most cases, be easily retrieved by any search engine. Try googling your name and you'll see what I mean. 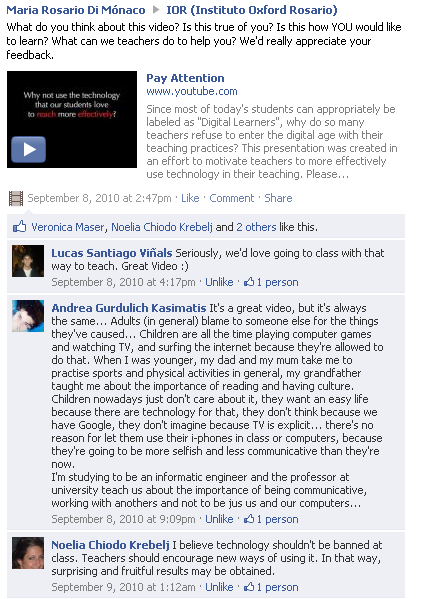 So why am I using Facebook with my students? Most of my students already have a Facebook account and use it on a daily basis as the main means of communication with their friends. I've found that, while I have to coax them to interact in their blogs, wikis and other social platforms, they seem to feel at home on Facebook and communicate there naturally and spontaneously. Since they are already there, this is a good opportunity to model approriate and safe internet behaviour. Although in my opinion "online privacy" is a contradiction in terms, I do believe "internet safety" is quite a different matter, and something we must endeavour to train our students in. How am I using it? I created a Facebook Group instead of a Page since that gives you greater control over who joins the group and what others can see. We post discussions on different platforms so those students who do not have a Facebook account do not feel left out or under pressure to create one, and are still able to communicate and interact with their peers. All the activities mentioned below are optional. Students are not forced to do them or marked on them. I somehow feel this would take away much of the fun. Writing: students post short reviews of the songs they would like to work with in their f2f video classes. Deciding what material they want to work with: polls are created with the students' suggestions and they have the opportunity to vote and have their say. Extra practice: I post links to external sites which provide practice for listening, reading, writing, speaking, grammar, vocabulary, international exams. Crosscultural experiences: again, I post links to safe pages that foster interaction with peers from all over the globe. These are just a few of the uses you can put Facebook to. And another good thing is that I don't even do half of the work. Most of what happens there isgeared by the students themselves. They upload material and interact of their own accord most of the time. Note: this group is promoted only among teens and adults. 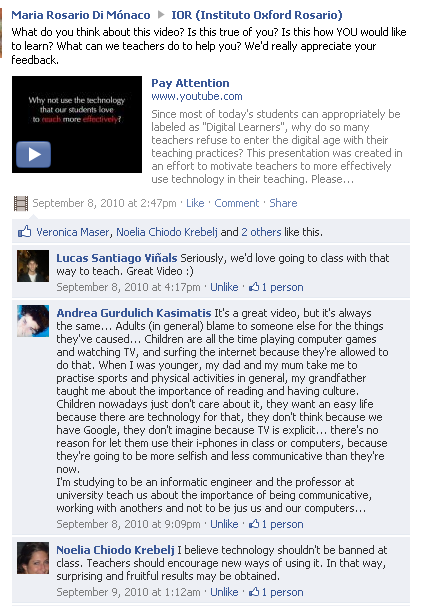 In the case of kids, we work with blogs and wikis. Using these tools regularly, it sometimes comes as a shock to me personally when I find out others are not aware of certain things that to others may seem to be obvious and often it is assumed that everyone else know that... As such, one of my learnings personally came to the use and knowledge of Facebook as a dashboard and service itself. It appears not everyone is aware that the event details will be shortened at times and not fully appear unless you expand them. 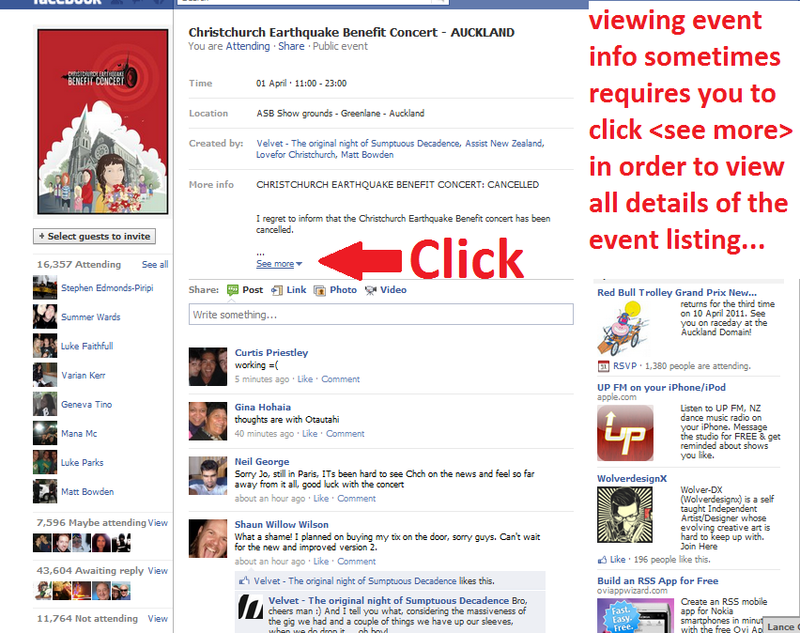 AssistNZ was recently contacted in regards to the promotion of the event “Christchurch Earthquake Benefit Concert”, which unfortunately was ultimately cancelled. We would like to clarify that AssistNZ did not take on the offered role of running a Twitter feed for the event, as this falls outside the scope of the advisory and consultant services that AssistNZ offers. One of our consultants did however agreed to help out in a personal capacity, on a voluntary basis, and set up and ran a Twitter feed about the event, as well as creating pages for the event on MySpace, YouTube and Soundcloud.Good work Jess, see more here. A substantial public response was received over these channels, and they proved particularly useful for coordinating with artists and performers. It was great to see how quickly people got the word out and the enthusiasm with which artists contacted us with information, tracks to add to playlists and all the other support that was received. We would like to extend a huge thank you to the sponsors and all of the many people who volunteered their time and efforts to help on this project, and it is with great regret that we heard the news from the promoters that the event had to be cancelled.